This chapter describes how to use the IDE to implement Enterprise JavaBeans (EJB) technology in applications. Written in the Java programming language, an enterprise bean is a server-side component that encapsulates the business logic of an application. The business logic is the code that fulfills the purpose of the application. In an inventory control application, for example, the enterprise beans might implement the business logic in methods called checkInventoryLevel and orderProduct. By invoking these methods, remote clients can access the inventory services the application provides. See Section 16.3, "Creating an Enterprise Bean." Because the EJB container provides system-level services to enterprise beans, the bean developer can concentrate on solving business problems. The EJB container, and not the bean developer, is responsible for system-level services such as transaction management and security authorization. Because the beans, and not the clients, contain the application's business logic, the client developer can focus on the presentation of the client. The client developer does not have to code the routines that implement business rules or access databases. See Section 16.4, "Calling an Enterprise Bean." Because enterprise beans are portable components, the application assembler can build new applications from existing beans. These applications can run on any compliant Java EE-compliant server provided that they use the standard APIs. Session Beans. Perform tasks for a client and implement Web services. See Section 16.3.1, "How to Create Enterprise Beans." Entity Beans. In J2EE 1.4 applications, entity beans are used to represent a business entity object that exists in persistent storage. In Java EE applications, entities are used instead of entity beans. For more about persistent entity objects, see Section 17.3.1, "How to Create an Entity Class." Message-Driven Beans. Act as listeners for the Java Message Service API, processing messages asynchronously. See Section 16.3.4, "How to Send JMS Messages." For additional information see Section 16.2.1, "How to Create an EJB Module Project," and Section 16.1, "About Developing with Enterprise Beans." The following steps summarize enterprise development tasks. Create the EJB module project. Register a Java EE application server. You cannot deploy EJB modules to the Tomcat server. Create the project for the EJB module. Add the EJB module to an enterprise application. For Java EE 5 applications, use Java Persistence. If you want to use a database schema, make sure the database schema file exists in your project's conf folder. Add business methods to your enterprise beans. Add select methods and finder methods to your entity beans. Edit the EJB module's deployment descriptors. Configure container-managed relationships between enterprise beans. Set the project as the main project and choose Run > Build Main Project (F11) from the main menu or right-click the project node in the Projects window and choose Build. For stand-alone EJB modules, right-click the EJB module's project node and choose Run. For EJB modules that are part of an enterprise application, right-click the enterprise application and choose Run. The IDE provides wizards to help you create EJB module projects for EJB 3.1 enterprise beans (EJB 2.1 is a mandatory part of the EJB 3.1 specification). The wizard can also help you create an EJB module if you already have existing source code. Choose File > New Project (Ctrl+Shift+N) from the main window. Enterprise Application. Lets you create an EJB module project as part of an empty enterprise application. For further information see Section 15.2.1, "How to create an enterprise application client." Enterprise Application with Existing Sources. Imports an existing enterprise application. EJB Module. Creates an empty EJB module in a standard EJB module project. See Section 16.2, "Creating an EJB Module Project." EJB Module with Existing Sources. Imports an existing EJB module into a standard project. Follow the steps in the rest of the wizard. For related information see Section 6.2.3, "Creating Standard Projects," and Section 12.2.1, "How to Create a Web Application Project." For standard EJB module projects, the IDE does not support J2EE 1.3 EJB modules and automatically updates the version number of your EJB module's ejb-jar.xml to 1.4. The J2EE 1.4 specification is fully backward-compatible, so upgrading the specification level does not change the behavior of your code. When you import an individual EJB module into a standard project, the module can have any folder structure. When importing an entire application using the Enterprise Application with Existing Sources template, the project's folder structure must adhere to the application structure shown in Figure 16-1. The IDE provides templates for creating session beans, message-driven beans, entity beans, and legacy CMP entity beans. Enterprise Java Beans can be added to EJB module projects. In the Projects window, select any existing EJB module project. See Section 16.2.1, "How to Create an EJB Module Project." Choose File > New from the main menu.The New File wizard opens. Follow the directions in the rest of the wizard. Adds a node for the enterprise bean under the project's Enterprise Beans node. This node can contain nodes for bean methods and fields. Updates the deployment descriptors for the EJB module and the Enterprise Application module that contains the EJB module. If your target server is the GlassFish server, the IDE also configures the server-specific deployment descriptors. For all other application servers, you have to write the server-specific deployment descriptors yourself. For more information on enterprise projects and beans, see Section 12.2, "Creating Web Application Projects," and Section 14.5.1, "How to Build an Enterprise Application Project and Sub-Projects." The IDE provides a wizard to generate session beans for entity classes. In the wizard choose the entity classes that require session beans. The wizard creates a session facade as well as the selected interfaces for the selected entity class. Right-click the module project node in the Projects window and choose New > Other. In the New File wizard, go to the Persistence category and select Session Beans for Entity Classes. See Section 17.1, "About Developing with Java Persistence." Select any entity classes from the list in the left pane and click the Add button. Any referenced entity classes are automatically added to the list in the right pane. The IDE generates session beans for each entity class listed in the right pane. Deselect Include Referenced Classes if you do not want session beans created for referenced classes. Select the location where you want to save the session beans. Select an existing package from the Package drop-down menu or type the name of a new package. Select the session facade interfaces that you want the wizard to generate. When you click Finish, the IDE creates session beans for each of the entity classes you specified in the wizard. A business method is a method inside an enterprise bean that performs some function and can be called from outside the bean. Business methods are written in the bean class and exposed through local or remote interfaces. If a business method is meant to be called by beans and clients that are running in the same JVM (on the same server), they are registered in the bean's local interface. If the method is meant to be called from a remote client, it is registered in the bean's remote interface. A session bean's business methods typically define tasks that the bean performs for clients. They are not necessarily associated with data in a database. In EJB 2.1 programming, an entity bean represents a persistent business object whose data is stored in a database. The bean adds behavior specific to that data. Therefore, an entity bean's business methods are typically accessor and mutator methods that enable you to read and update information in a database that represents a business concept. Entity bean business methods are almost always local methods, since remote clients should only access an entity bean through a facade session bean. When you create an EJB 2.1 enterprise bean (J2EE 1.4), the IDE creates a special BeanInterfaceBusiness interface in which it registers business methods. The bean interface extends the Business interface and the bean class implements both the bean interface and the RemoteBusiness interface. The advantage of this approach is that it lets you separate the business logic from implementation logic, and that it lets you check at compile-time that your bean implements the given interfaces. If you want to register business methods directly in the bean's interfaces, delete the Business interface files. Then edit the bean interface to not extend the Business interface and edit the bean class to not implement the Business interface. When working with EJB 3.0 or EJB 3.1 enterprise beans, there is no need for a separate Business interface because the enterprise beans are regular Java objects and therefore have only the remote and local interfaces. Open the bean class in the Source Editor. Right-click anywhere in the Source Editor and choose Insert Code > Add Business Method. Specify the method parameters in the Parameters tab. Specify the exceptions that the method throws in the Exceptions tab. Specify whether to add the business method to the local interface, remote interface, or both. Click OK to create the method. The IDE adds the method signature to the interfaces and the method body to the bean class. Edit your new business method. You can also just code a regular method and then click the IDE hint in the left margin and choose an interface from the popup menu. When the IDE adds a business method to an enterprise bean, it does not save the bean class or the bean interfaces. Only when you compile or save the class is the new method saved to disk. A Java Message Service (JMS) message is an object that communicates information between JMS clients. The message is sent from one client to a second client that listens for messages through a JMS destination on an application server. In the IDE, you can automatically generate code to send a JMS message to any message-driven bean in an open project. (Optional) Create a service locator class to handle getting the reference to the database. See Section 16.3.5, "How to Use a Service Locator." Open the Java file from which you want to send the JMS message. The file must be in an EJB module project or a standard web application project. You cannot generate lookup code in a free-form web application project. See Section 16.3.4, "How to Send JMS Messages," and Section 23.3.9, "How to Set up a JMS Resource." In the Source Editor, right-click in the file and choose Insert Code > Send JMS Message. Select the message-driven bean that is the destination for the message. You can switch between open projects using the Project drop-down menu. Under Service Locator Strategy, specify whether to generate inline lookup code or use an existing service locator. Click Browse to search for the service locator class name. createJMSMessageForNewMessageDestination. The method that creates the message that is sent. You should implement your business logic in this method. sendJMSMessageToNewMessageDestination. The method that handles the message you created in the method above. You should not modify this message. The IDE also registers the resource reference and message destination reference in your module's general deployment descriptor. If your project's target server is the GlassFish/Sun Java System Application Server, the IDE automatically configures a destination and connection factory for the message-driven bean when you create the bean. If you are deploying to a different application server, you have to configure the server-specific deployment descriptors and the server resources yourself. You can create a regular service locator or one that caches the obtained reference for further use. Generally you use a caching service regulator in web applications and a regular service locator in the business tier. Enterprise beans especially need non-caching service locators. Because each enterprise bean has a unique JNDI name space, a resource reference with the same name can be declared in multiple enterprise beans, potentially with different types. From the Enterprise category, select Service Locator or Caching Service Locator. Call Enterprise Bean, see Section 16.4.1, "How to call an Enterprise Bean." Use Database. For more information, see Section 24.1, "About Working and Connecting with Databases." Send JMS Message, see Section 16.3.4, "How to Send JMS Messages." Send E-Mail, see Section 16.3.7, "How to Send an Email from a Java File." In the Service Locator Strategy section, select Use Existing Class and specify the class name of the service locator. Use the Browse button to search for the class. The service locator template is fully functional. You do not need to modify the code, although you can customize its caching behavior. You can only create a service locator in a web application project or EJB module project. For more information, see Section 16.3.6, "How to Access a Connection Pool from a Java Class." Applications that are deployed to servers often need to access databases that reside on remote machines. You therefore have to set up a JDBC connection pool on the server that points to the database. You then create a data source that connects to the connection pool and use the data source's JNDI name to acquire a connection to the database. See Section 23.3.7, "How to Set up a Connection Pool." (Optional) Create a service locator class to handle getting the reference to the database. Open the Java file from which you want to access the database. In the Source Editor, right-click the file and choose Insert Code > Use Database. For more information see Section 24.1, "About Working and Connecting with Databases." Enter a JNDI name for the database connection. This name must be the same as the JNDI name of the JDBC data source for the database on the target server. See Section 24.3.2, "How to Connect to the Java DB Database." If you are deploying to the GlassFish Server, you can also generate a connection pool and data source for the database connection by selecting the Create Server Resources checkbox. The resources are created under the project's Server Resources node. If the JDBC driver for the database server is not registered in the IDE, click Add Driver. Click Add Connection to connect to the database. The Use Database command is only available in EJB module and web application projects. Open the Java file from which you want to send the e-mail message. The file must be in an EJB module project or a standard web application project. You cannot generate lookup code in a free-form web application project. In the Source Editor, right-click the file and choose Insert Code > Send E-mail. Specify the JNDI name of the mail resource on the application server. getSession. This method looks up the mail resource and creates a mail session. sendMail. This method constructs and sends the e-mail. The IDE also registers the resource reference in your module's general deployment descriptor. In your code, call the sendMail method and pass the e-mail address, subject, and body as parameters. You have to configure the JavaMail resource on the application server yourself. If your project's target server is the GlassFish server, you can use the JavaMail Resource template found in the New File wizard GlassFish. If your project's target server is the GlassFish server, the IDE automatically configures the resource reference in the application-specific deployment descriptor. If you are deploying to a different application server, you have to configure the server-specific deployment descriptors yourself. For additional information see Section 12.10.2, "How to Edit Deployment Descriptors," and Section 16.5.3, "How to Edit the Deployment Descriptors of an EJB Module." Calling an enterprise bean is the process of getting a reference to the enterprise bean so that you can call its methods. The IDE can assist you in calling an enterprise bean from any Java class in an EJB module, web application, or enterprise application client. Open the IDE project that contains the enterprise bean that you want to call. Open the file from which you want to call the enterprise bean. In the Source Editor, right-click anywhere in the body of the class and choose Insert Code > Call Enterprise Bean. In the dialog box, select the enterprise bean that you want to call. (Optional) Type a new name for the reference. Specify whether to reference the local interface or the remote interface. To reference a bean's local interface, the class that is referencing the bean must be packaged in the same enterprise application as the enterprise bean. The enterprise bean project is added to the caller project's classpath. A lookup method is created in the caller class. If the lookup is made from an enterprise bean implementation class, the reference is added to the corresponding bean. If the lookup is made from any class of a web application, the reference is added to the web application. If the lookup is made from a plain Java class of an EJB module, no reference is added. In this case, the reference has to be added manually to the bean calling the plain Java class. The IDE cannot assist you when calling an enterprise bean from a free-form web application project. As part of a Java EE application. The IDE packages all of the necessary JAR files as part of the Java EE application and not as part of the individual modules. This is the most common way of building an EJB module. As a stand-alone EJB module. The IDE packages the necessary JAR files with the EJB module JAR file. When an EJB module is part of an enterprise application, its enterprise beans can be accessed from external clients and web application modules through its remote interfaces, and by other modules in the enterprise application through its local interfaces. All of the JAR files needed for execution are packaged in the enterprise application's EAR file and the classpath to these JAR files are written in the EJB module's manifest file. This is the most common way of deploying an EJB module. Deploy. This stops the enterprise application, undeploys the application or stand-alone module from the application server, and deploys your local version. Run. Like Deploy, except that for enterprise applications, this command also opens the client module's default URL in the external browser. The IDE packages all of the necessary JAR files as part of the Java EE application and not as part of the individual modules. This is the most common way of building an EJB module. In the Projects window, expand the enterprise application's Java EE Modules node and make sure that the EJB module is listed. If you have not added the EJB module to the enterprise application, right-click the Java EE Modules node, choose Add Java EE Module, and select the EJB module. Right-click the enterprise application project and choose Build. Or, if the enterprise application project is the main project, choose Run > Build Main Project (F11) from the main menu. To set a project as the main project right-click the project in the Projects window and choose Set as Main Project, or, choose Run > Set Main Project from the menu bar and select the project in the sub-menu. Compiles the classes to the project's build/jar-module folder. Places any JAR files, libraries, or directories that are on your project's classpath and are scheduled for inclusion in deployment in the enterprise project's build folder. Builds the EJB module's JAR file to the EJB module project's dist folder and copies it to the enterprise application project's build folder. The EJB module JAR file does not contain any of the classpath elements. Puts a Class-path entry in the EJB module's manifest file for all included JAR files and puts a . entry if there is at least one directory on the project's classpath scheduled for inclusion in deployment. This mechanism ensures that the JAR files and directories can be used from the EJB module even if they reside in the EAR project and not in the EJB module itself. The IDE packages the necessary JAR files with the EJB module JAR file. Right-click the EJB module project in the Projects window and choose Build. Or, select the EJB module project in the Projects window and choose Run > Build Project (Build Main Project (F11) if the EJB module project is set as the main project). 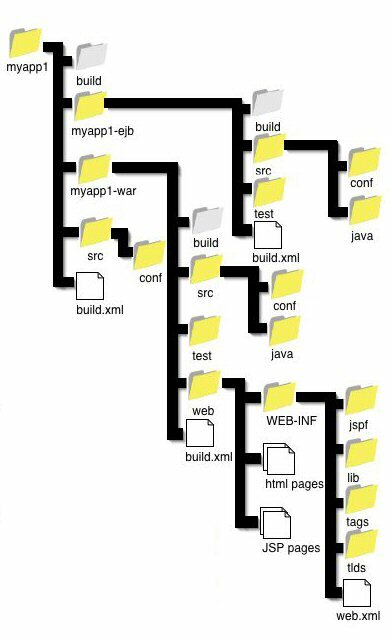 Compiles the classes to the project's build/jar folder. Places any JAR files, libraries, or directories that are on your project's classpath and are scheduled for inclusion in deployment into the build/jar folder. Builds the EJB module's JAR file to the EJB module's dist folder. The JAR file includes all classpath items scheduled for inclusion in deployment. To mark a classpath item for inclusion in deployment in the EJB module's Project Properties dialog box, right-click the module's Libraries node and choose Properties, then select the checkbox for each classpath item you want to include in deployment. If you are developing enterprise beans on the Java EE 5 platform and deploying to a Java EE 5 compliant application server, you develop enterprise beans using EJB 3.0 technology. If you are developing enterprise beans on the Java EE 6 or Java EE 7 platform and deploying to a Java EE-compliant application server, you develop enterprise beans using EJB 3.1 technology. EJB 3.0 and EJB 3.1 technology support the use of annotations in your code to describe behavior that was described using deployment descriptors in EJB 2.1 technology. As a result, deployment descriptors files are no longer required when deploying to a Java EE-compliant server. EJB 3.0 and EJB 3.1 technology also support the use of deployment descriptors. You may need to use a combination of annotations and deployment descriptors in your project when you configure your project, for example to configure security settings. The general Java EE deployment descriptor that configures deployment settings on any Java EE-compliant implementation. The general EJB deployment descriptor is called ejb-jar.xml. The IDE provides a visual editor for the general deployment descriptor and automatically updates the descriptor file when you edit your code. The server-specific deployment descriptor that configures deployment settings for the application server to which you are deploying. For the Sun Java System Application Server, the IDE automatically updates the deployment descriptor files as you edit your files. For all other application servers, you have to write the server-specific deployment descriptors yourself. The IDE provides a visual deployment descriptor editor to help you edit some descriptor files. You can also use the XML editor to edit your descriptor files. In the Projects window, expand the Configuration Files node for your EJB module project. Double-click ejb-jar.xml to open the file in the visual editor. General. This tab enables you to specify general information about the EJB module, details about security roles and descriptor details about each of the enterprise beans in the module. CMP Relationships. This tab enables you to view and modify CMP relationships for CMP beans in your module. XML. This tab enables you to edit the descriptor file in the XML editor. Double-click glassfish-ejb-jar.xml to open the file in the visual editor. Select a tab at the top of the editor. Edit the descriptor file as necessary and save your changes. Double-click the deployment descriptor node in the Projects window. The IDE opens the XML source of the deployment descriptor in the Source Editor. If you enter any XML syntax errors the IDE automatically alerts you. To fully ensure your changes have not cause any errors, you should verify the EJB module. In the Projects window, right-click the enterprise application project and choose Run or Deploy. For additional information see Section 23.4.1, "How to Register a Server Instance." If the module is part of an enterprise application, right-click the enterprise application project and choose Debug. If the module is a stand-alone EJB module, right-click the EJB module project and choose Debug. Before you deploy an enterprise application or any stand-alone web or EJB module to the application server, you should verify it, to ensure it is properly implemented to the Java EE specification. When the target server for the project is the Sun Java System Application Server or GlassFish application server, use the verifier tool to validate both Java EE and application server-specific deployment descriptors against their corresponding DTD files and display errors and warnings if a module or application is not compliant. You can verify deployment descriptors in EAR, WAR, RAR, and JAR files. The verifier tool is not simply an XML syntax verifier. Rules and interdependencies between various elements in the deployment descriptors are verified. Where needed, classes in your module are examined to ensure that what is referred to in the deployment descriptors actually exists and works when deployed. Not all failures to comply with the Java EE specification cause the application to fail. However, modules that fail to comply with the specification might not be portable between application servers. The verifier tool helps you ensure your code is not locked into running only on a specific application server. Enterprise beans in a stand-alone EJB modules can only be accessed through their remote interfaces. All of the JAR files needed for execution are packaged in the EJB JAR file itself. In the Projects window, right-click the EJB module project and choose Run or Deploy. In the Projects window, right-click the EJB module project and choose Debug. Compiles the EJB module if necessary. Stops the application server and starts it in debug mode. Deploys the EJB module to the application server. Starts a debugging session, attaches the debugger to the server, and opens the debugger windows at the bottom of the IDE screen. Since an EJB module does not have an executable class, there are no local variables or calls on the call stack. To debug the functionality in the EJB module, use an application client or web application to access the EJB module's methods. In the Projects window, right-click the enterprise application project and choose Debug. Compiles the EAR file if necessary. Deploys the enterprise application to the application server. Starts a debugging session, attaches the debugger to the server, and opens the debugger windows at the bottom of the IDE screen. If the application has a designated web application and URL to run, the IDE opens the URL in the external browser. If your EJB module is part of an enterprise application, you should always debug it by running the debug command on the enterprise application project. Since the IDE does not know which enterprise applications an EJB module project belongs to, running the Debug command on an EJB module project deploys it as a stand-alone module. When debugging an enterprise application, if your application contains any projects not listed in the Packaging page of the enterprise application, you must explicitly specify these projects if you want the IDE to include them in the classpath when you debug the application. To specify the projects to include, right-click the enterprise application project node in the Projects window and choose Properties. In the Properties dialog box, select the Libraries category and add the projects to the Embedded Classpath Elements list. The debugger windows filter out any information from method calls running on the server. For additional information see Section 23.3.1, "How to Register a Server Instance." If your EJB module is part of an enterprise application, you should running the profile command on the enterprise application project. Since the IDE does not know which enterprise applications an EJB module project belongs to, running the Profile command on an EJB module project deploys it as a stand-alone module. If you are deploying your EJB module or enterprise application to a local installation of the GlassFish server, go to the main menu and choose Profile > Profile Project and choose the project in the sub-menu, or, by right-click the project node in the Projects window and choosing Profile from the pop-up menu. If you are deploying your EJB module or enterprise application to a remote server, you must attach the IDE to the remote server and profile the application in Attach mode. The Attach Wizard can help you configure the remote server to accept attachment. In the Projects window, right-click the EJB module project and choose Profile. Select a profiling task and click Run. Stops the application server and starts it in profile mode. Starts a profiling session, attaches the profiler to the server, and opens the Profiler window in the IDE. After the application is deployed to the server, you should invoke its code the same way as you would for debugging or just evaluating application functionality. You can use an application client or a web application to access the EJB and invoke its code. You can view the profiling data once the application code is invoked. In the Projects window, right-click the enterprise application project and choose Profile. If you are analyzing application performance, choose the Profile Projects & Subprojects Classes filter to ensure that the classes in your EJB module and web module projects are profiled. If you do not choose this filter, the classes in the EJB module and web module are not profiled. In the Analyze Performance pane, choose the Profile Projects & Subprojects Classes filter and then click Show Filter Value. Click To Quickfilter in the dialog box. In the Set Quick Filter dialog, select a filter type, edit the filter values to limit the classes that are profiled, and click OK.
Make sure that Quick Filter is selected in the Filter drop-down list when you run the profiling session. Starts a profiling session, attaches the profiler to the server, and opens the Profiler window in the IDE. If the application has a designated web application and URL to run, the IDE opens the URL in the external browser. For more on profiling see Chapter 9, "Testing and Profiling Java Application Projects." To use local JUnit tests to test an EJB module that is deployed on a server, you must configure the tests to act as a remote client of the EJB module. This means you can only access the EJB module through its remote interfaces. For information on JUnit unit testing, see Section 9.3, "Creating a Unit Test." Usually, you have some entity beans and a session bean with remote interfaces that provides clients access to the entity beans. You have to generate tests for the session bean's bean class and modify the test file to reference the session bean and test each of its business methods. Create a service locator file somewhere in the test package source root. Open the enterprise bean's bean class in the Source Editor and choose Tools > JUnit Tests > Create Tests (Ctrl+Alt+J). Accept the default options in the dialog box and click OK. In the test class, delete the test methods that just test EJB infrastructure methods such as testEjbCreate and testEjbRemove. Declare a variable for the remote home interface. You do not have to use a service locator class. You can write the lookup code from scratch. EJB 2.1 entity beans are part of the EJB 2.1 specification and are used in J2EE 1.4 enterprise applications. NetBeans IDE 8.0 no longer supports developing applications that use J2EE 1.4 technology. To develop J2EE 1.4 applications you should use NetBeans IDE 7.3 or earlier versions of the IDE.